We slept in late on our first morning in Eskifjordur; the long drive the day before really wore us out. 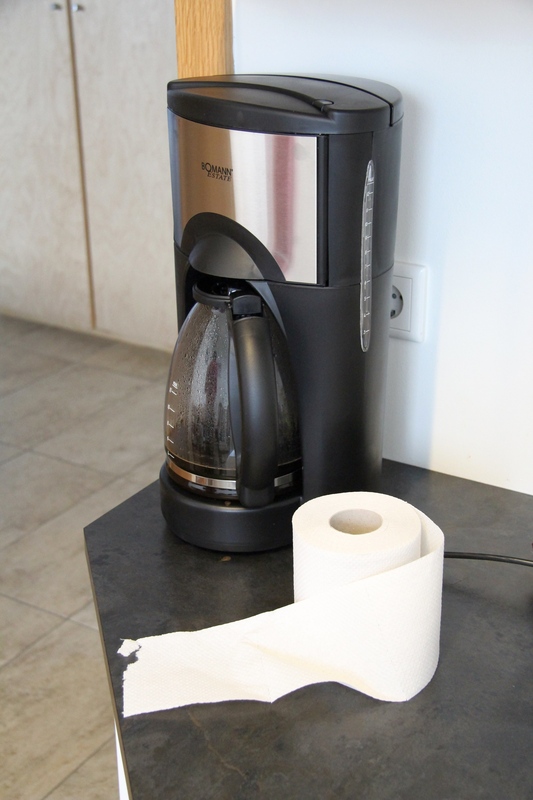 The apartment we rented was missing something very important: filters for the coffee machine. Rather than run around the village trying to find filters that fit this particular machine, I improvised and used wadded up toilet paper as a filter. A little messy, but it did the job and I was properly caffeinated. The weather this morning was cold and rainy. Our plan for the day was drive to Lagarfljot, a long, narrow lake in the interior of eastern Iceland. The area around this lake is known for having some excellent hiking possibilities and one of the more picturesque waterfalls in the country. To get there, we had to drive over a mountain pass, where it was snowing rather heavily. Fortunately, the weather improved as we crossed the pass and headed down toward the lake. As we drove along the eastern shore of Lagarflot, we went through an area called Hallormsstaðarskógur, the largest forest in Iceland. We’d seen the occasional small tree here-and-there since we arrived in Iceland, but this was the first time we’d come across an entire forest. The thick birch and ash trees looked more like bushes than trees, but that’s pretty much what constitutes a forest in Iceland. On the southern end of Lagarflot, we parked the car, shouldered our packs, and started the steep hike to Hengifoss, Iceland’s second highest waterfall. Thankfully, the snowfall we encountered on the drive over to the lake did not follow us; the weather here was cloudy, but pleasant. We reached the base of the falls after about an hour of hiking. The rock cliffs around the falls showed bands of a beautiful reddish-pink rock that made for a colorful backdrop to the cascading water. We spotted this phenomenon in a number of places around the country. 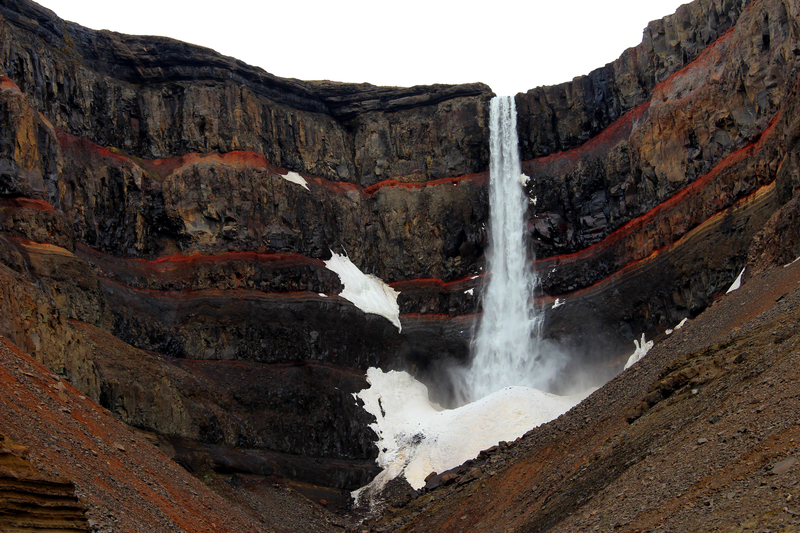 The red bands of rock indicate an ash layer from volcanic eruptions that occurred thousands of years ago. Like rings on a tree, these bands show exact times when major volcanic eruptions occurred in the past. After adding to our extensive collection of Icelandic waterfall photos, we headed back to the car. After the somewhat strenuous hike to Hengifoss, we both had a sweet tooth that needed satisfying. As it happened, just down the road from the Hengifoss trailhead, is Skriduklauster, a museum located on the site of a 16th century monastery. The museum has extensive displays about the history, and the subsequent archaeological excavations, of the old monastery; but that’s not what we’re interested in. We had a need for sweets, and the restaurant on site had just the thing: From 2:30-5:30, they serve an all-you-can-eat cake buffet. We arrived right at 2:30 and we were the only customers; thus, we had the cake buffet all to ourselves. It was expensive, but worth the price as we were treated to some amazing local bake goods. After getting a good sugar buzz, we took a brief tour through the museum, and then headed back to our home base in Eskifjordur. After dinner, we decided to drive over Iceland’s highest mountain pass to the nearby town of Neskaupstadur. 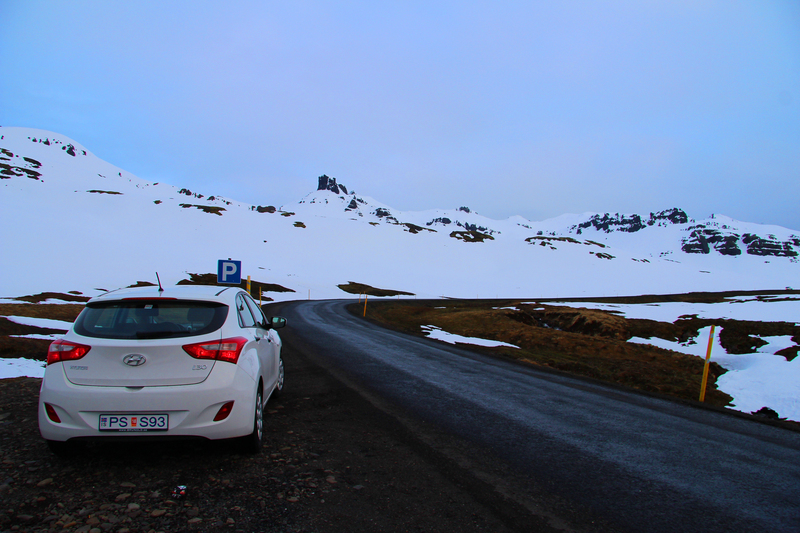 Although the town was only a few miles away, it required driving over the highest mountain pass in Iceland. The area around the pass was still covered in snow, so much snow that a small ski area on the pass was still operating. At the top of the pass, we had to drive through a long, single-lane tunnel. We weren’t quite sure what would happen if someone was coming from the other direction (tunnel instructions were all in Icelandic). We crossed our fingers, and zipped through the tunnel before having to deal with that question. Driving down the other side of the pass to Neskaupstadur was like entering a whole different world. Even though it’s one of the larger towns in eastern Iceland, it felt like we were at the far end of the world. We parked the car at the far end of town and walked along a short path that followed the top of the cliffs above the stormy sea to a sea cave. Here we found what looked like tiny geodes imbedded in the ancient lava rock. Our second full day in Iceland’s east coast was spent exploring a couple of small villages nestled in spectacular fjords. 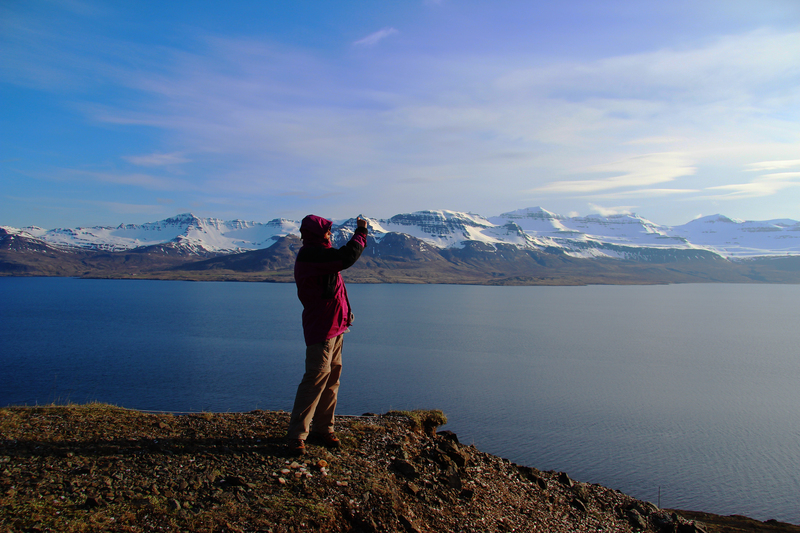 Our guidebook raves about the town of Seydisfjordur, so we decided to make this our first stop. 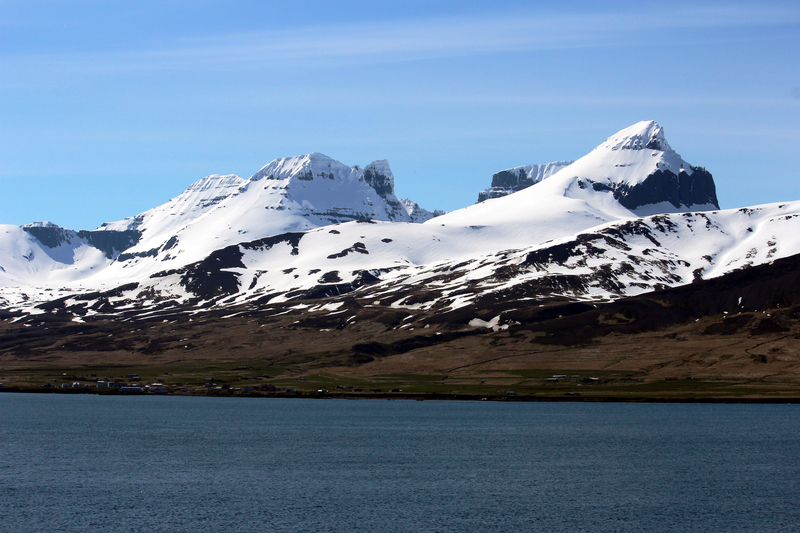 After crossing yet another snow-covered mountain pass, we drove into sleepy Seydisfjordur. Sleepy is probably a bit of an understatement; at the time of our visit, it was downright dead. The town is Iceland’s stop for the ferry from Europe. Wednesdays tend to be busy as people are getting on/off the ferry; all other days, it’s pretty quiet. 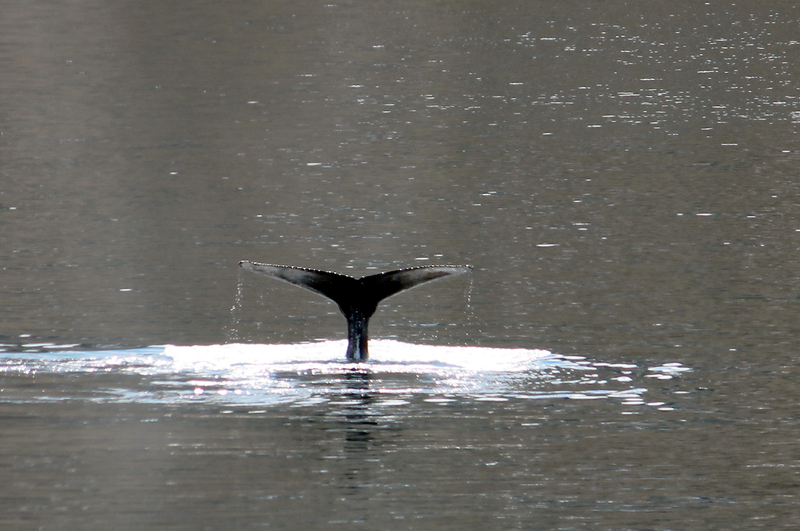 We drove to the opposite side of the fjord from town, where we found a nice hillside to have lunch and watch two humpback whales swimming around the bay. We drove back over the snowy mountain pass to our next destination: Borgafjordur, an isolated village at the end of the main “highway” in the far north corner of eastern Iceland. This part of our road trip taught us a little something about Iceland’s highway system: just because it shows as a “highway” on the map doesn’t mean it’s paved. 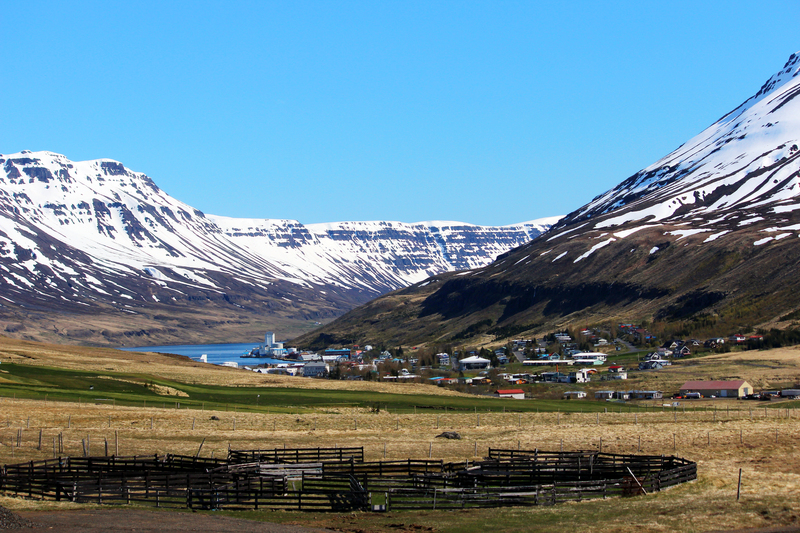 The road to Borgasfjordur is a perfect example of this as a big chunk of the highway is without pavement. The non-paved parts were plenty good enough for a car, but it was pretty bumpy in places for our little rental car. At least the weather was fine today, so no mud to deal with. Our reason for choosing to visit Borgafjordur was very simple: find lots of puffins. At the end of the road, just past the town, is Hafnarholmi, a small island that is home to a rookery teeming with birdlife. The island is also home to a large Puffin colony. 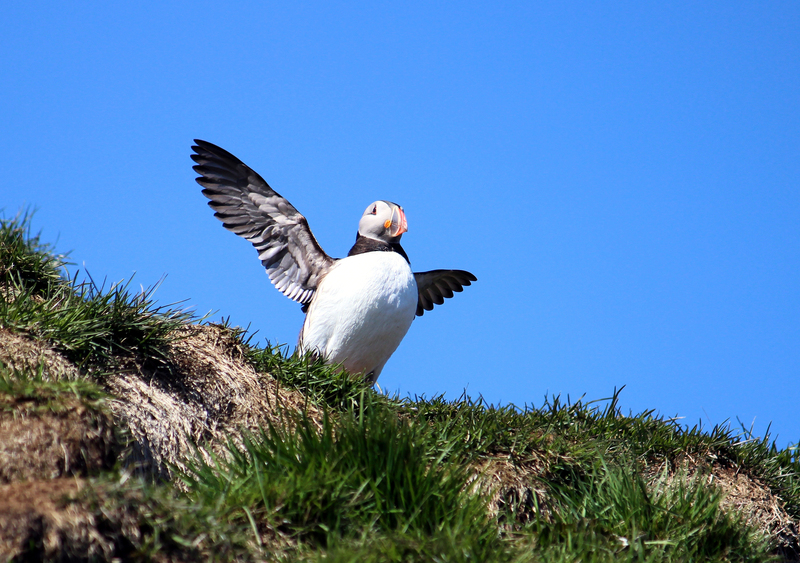 A series of boardwalks and viewing platforms around Hafnarholmi allows you to get close to the Puffins and other birds. Our arrival was in the middle of the day, which is when Puffins are generally feeding in the ocean or sleeping in their nests. Still, we were delighted to see Puffins occasionally pop up out of their nest before flying down to the water for a meal. After the long drive back to our base in Eskifijordur, we cleaned up, had a nice meal, and decided to do a little evening exploration of the magnificent fjord just outside of town. At the end of the road is the remains of the world’s largest Spar quarry. Spar is a type of calcite crystal that is transparent and was once widely used in precision optics, such as microscopes. The quarry was started in the 17th century and didn’t shut down until 1924. Other than some small pieces of equipment, a large crater, and scattered specimens of spar lying about, not much is left of the original quarry. The best part of the hike was that from the quarry, we were treated to a spectacular view of the fjord in the soft evening light. This entry was posted in International Travel and tagged Borgafjordur, Eskifjörður, Hallormsstaðarskógur, Hengifoss, humpback whales, Lagarfljot, Neskaupstadur, Seydisfjordur, Skriduklauster, Spar. Bookmark the permalink.